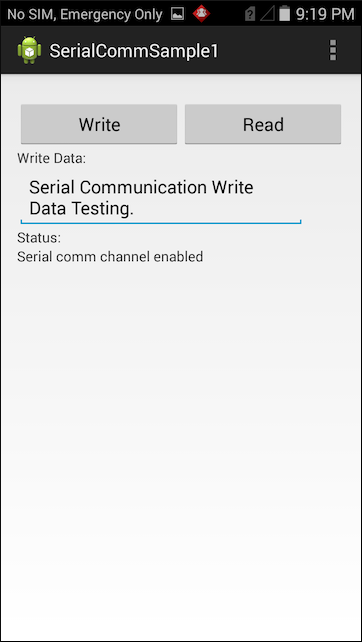 Demonstrates the EMDK Serial Communication API to enable support for DEX (data exchange) in an application. DEX is a format for collecting audit and event data from vending machines. Note: In order to use Serial Read functionality, you must first apply a patch provided in SPR-28877. To obtain this patch, contact Zebra Support. For more information about setting up the EMDK please see the EMDK Setup Guide. With the Snap on DEX cable attached, the application should look like the following when it starts. Press the Write button. The application should display a message that it has sent the text from the edit field in number of bytes sent in the status area. Press the Read button. The application will continue to read for 10 seconds and then display the read data in the status area.